I have followed the career of South-African artist Hermann Niebuhr for many years and am familiar with the evolution of his style. He is best known (and loved) for his painterly portraits of Egoli, City of Gold, Johannesburg, with its towering skyscrapers in lush yellows and reds and blues. A few years ago, after a trip cycling through the Far East, he made a series of mountainous landscapes into which a road led on and on, until in a final painting it seemed to dissolve into light. Next came a series of nightscapes of the roads that traverse the Highveld around Johannesburg, flanked by tall mine-dumps and twinkling lights at the edges of the darkness, or perhaps a set of lonely taillights showing where the road disappears at the horizon. These paintings of roads were followed by simplified landscapes without any roads, with very little in the way of varied shapes. They became mere undulating sweeps of paint, laid on with astonishing boldness and facility and evoking every mood of the land and sky. I ought not to have been surprised, when the artist started posting seascapes on his Facebook page, one after the other. The same painterly sweeps, but now flattened and even more simplified. No more land, no more roads, nowhere to go. Just the restless, heaving sea, overhung with lowering clouds, ever darkening. To me these pictures were extraordinarily moving and they seemed to twang a string deep inside me. Some, like the one shown above, even made me cry. Such fearful beauty. Then, one day, the artist announced that these paintings were to be shown at an exhibition entitled ‘Love Song for the End of the World’. 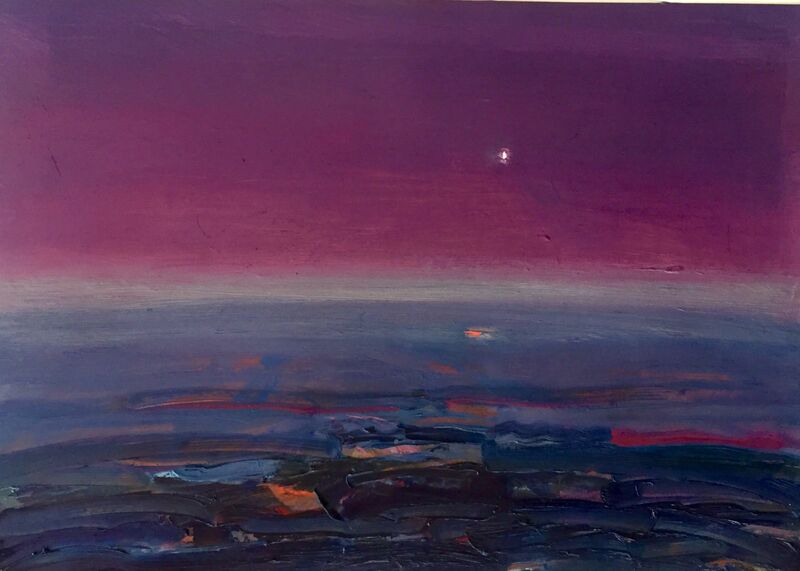 I could not attend the show, but wrote to the artist: “The heart of God glows from the walls of the gallery,” for I believe that this latest body of work expresses the sadness of the loving Creator for his creation. In Genesis, we are told that the Spirit of God hovered over the dark and restless waters and called forth order from the chaos, and it was good. But the story of mankind is a sad one. Jesus sat overlooking Jerusalem and wept, because she “would not.” The Father called, his children remained deaf. In his artist’s statement concerning the show, Niebuhr wrote: "These works are not an attempt to create an activism around environmental issues per se, but rather a poet's lament at the loss of a relationship. It's the parent’s lament at the passage of time, the child's accountability with aging. They are neither literal warnings nor admonishments, or necessarily calls to action. These works are not trying to be evocations of a post-apocalyptic landscape, but rather they are an attempt to describe the tender bond that exists between things (in this case mankind and her home) at the moment of realization that an ending is inevitable. And as this terrible beauty is born, as the waters rise, it does so with a sorrow that is given us to witness." Niebuhr was brought up in a Christian home and as a young teenager he thought of becoming a pastor. I see his pastor’s heart and I see his prophetic vision. The end of the road leads into brightness as the cyclist pushes up and up into the mountains. The road vanishes. There is black, heaving darkness as all becomes night. And then, there is a streak of light. There is the Morning Star. There is Jesus. 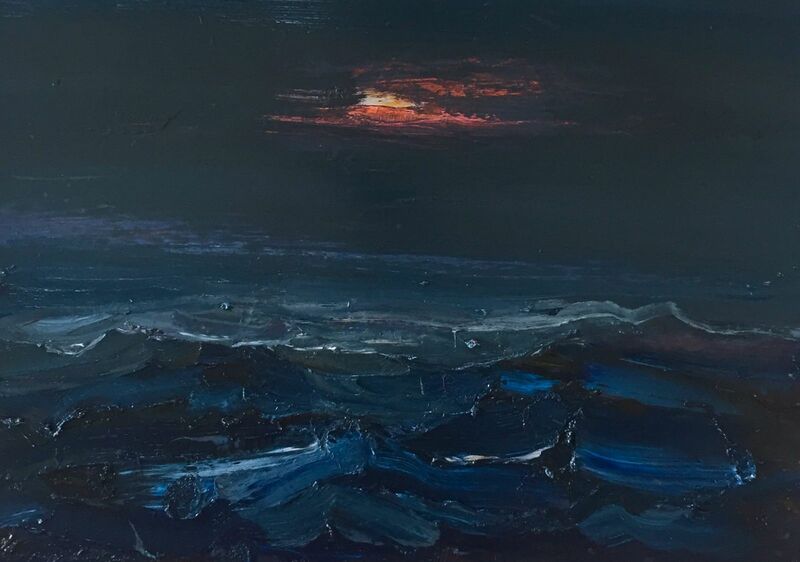 Hermann Niebuhr: Angry sea, 2016, oil on paper, 43x60cm. Hermann Niebuhr: Morning star, 2016, oil on paper, 60x83 cm. Hermann Niebuhr is a South-African artist who was born in Johannesburg in 1972. He studied at Rhodes University, Grahamstown and graduated with a Bachelor of Fine Arts (with distinction in History of Art) in 1993. He was awarded bursaries in 1990 and 1994 (Rhodes Masters Degree Scholarship), and 1996 (Raymond Pullen Scholarship for painting). For more, see http://www.niebuhr.co.za and https://www.facebook.com/hermann.niebuhr/media_set?set=a.10150730581321454.466115.723271453&type=3.